Music in video games is brimming with wasted potential, separated from the design process rather than being considered an integral piece of a complex machine. That's according video game composers James Hannigan and Olivier Derivière, who spoke at Develop:Brighton last week about challenging the tropes of music in games. From a lack of communication between developers and composers, through to matters of trust, and simply not understanding the versatility of the medium, the two composers broke down where video game music is going wrong. 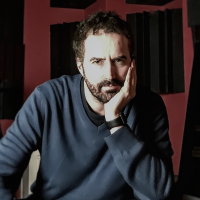 "Historically games development has seen audio as something you just stick on top of the game, you don't actually think of it as part of the design," said BAFTA and IFMCA winner James Hannigan, known for his work on Dead Space 3 and Red Alert 3. "Of course there are exceptions to that, but generally that can be the case. It's important to have that dialogue. The composer should have access to the designer and there should be a discussion about what the music is there for and what you want to say with it... That's what the composer does. The composer doesn't just implement someone else's musical vision... They also tally it to a situation and then translate that into music." This is a sentiment clearly echoed by Olivier Derivière, BAFTA nominated composer of Get Even, who added that working closely with a composer, rather than just dictating, can unlock the full potential of a game. "It's all about the relationship with the developer," he said. "I myself cherish a lot the relationship with any developer I work with because I believe that by understanding their game, their needs, you can as a composer provide for them things they can't envision because it's not their job; it's your job as composer for video games, because this is where it gets a little different." This all ties in closely with the view that the best composers for games are the ones who actually play games. "I'm not saying you should know everything to be involved, but you need to understand at least what it is to be a gamer," he added. "That's something a lot of composers out there don't do because they are not being asked. "Me, I always play the game. I try the game as a gamer, and I think this builds up the relationship with the developer. They understand that I try to understand their vision, so they know that if I have something to say it's my own experience as a gamer, not just as a composer." It's a problem underlined further by Hannigan, who said the passive experience of viewing a film is so different from the active experience of playing a game, but is rarely capitalised on by composers. "Music doesn't exist for a passive viewer, it also can be part of their inner world; it's the player's emotional reality," he said. "I think particularly in a first-person game, there is this suggestion that this is you, immersed in the game world, these are your senses. "So why would you treat the player as a passive film audience and throw this canned music at them? Why not use music to draw them into the experience, the emotional reality of the game, and actually have this music floating around in their minds as well as being non-diegetic."